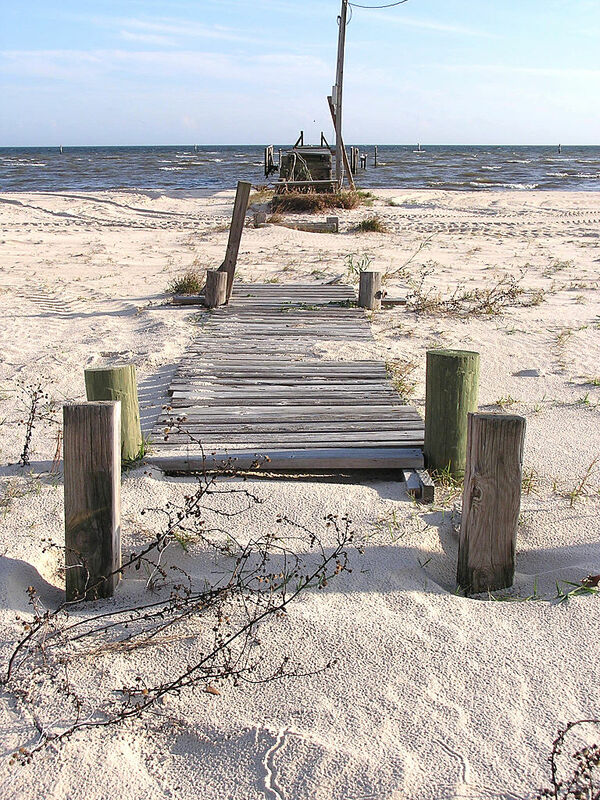 A broken pier on the beach in Waveland. By photographer Shawn Lea from Jackson, MS, US. But this is not how the story goes. This is not how the wound is healed, this is not how trauma affects us, affects our communities. The linear narrative we prefer smooths over the ongoing struggle of survival. I went to Waveland, MS in March of 2006. I was a sophomore in college, taking an alternative spring break trip with another dozen or so undergraduates. So, I write this post with a little trepidation: I am an outsider. Though Katrina touched my life in several ways, it was all tangential. I lost no property, no loved ones. I watched, I witnessed mostly from a distance. I wish I remembered why I pursued the trip to Waveland. I can only remember an overwhelming sense that there was something more than what the news reported happening after the hurricane. So, I found myself traveling to Waveland, “the eye of the storm,” we were told. A small coastal town, it had a population of about 8,000 before the storm, though now there are only about 6,400. Houses along the shoreline were flattened, swept away. Most of our work over the week was hauling debris, clearing foundations where there were once houses. Almost six months after the storm, they were still cleaning out space, still sifting through sand and mud and wood and memories. I remember the last house we worked on. A pile of wires, shingles, leaves and sticks atop a slick, shiny hardwood floor. Bright pieces of plastic, dusty and caked with sand and mud laid among broken boards. Pieces of a life, an entire household of lives, on display. It wasn’t just a house, it was a home — defined not by the crushed roof and walls but by the knick-knacks and photos inside. Under the broken boards, I saw voided checks that had bought groceries, floppy disks and CDs backing up files that would never be seen again. The woman who owned the house told us stories. Not really about the storm — we were told not to press community members for stories of the storm (we still heard some, especially about the thirty-foot storm surge that wiped out the town). But she talked about her family members, about children and grandchildren. She talked about faith. In between the words, in the spaces of her breath, she showed us she was surviving. Narratives of trauma are not linear. They are unpredictable. Psychiatrist Judith Herman’s defining work, Trauma and Recovery, describes the development of trauma as subject to cycles of remembering and forgetting. The person who has experienced trauma may have trouble recollecting the events that occurred; and then, at times, the memories will intrude on her consciousness, uncontrollable and overwhelming. The same goes for collective memory and trauma. In fact, this cycle impacts even the study of trauma — as Herman lays out the history of trauma theory, she notes how interest in the topic ebbs and flows over time. Often, it is a political event, a shared, communal experience that brings trauma back to our attention. Hurricane Katrina was such an event. It marked the start of a high tide for discussions of race, poverty, and inequality. The suffering and struggle of New Orleans was placed under a magnifying lens — for a time. Then the tide waned, and the discussions began to fade. New crises seized our attention. But the tide is turning again. Ten years later, we are again facing hard conversations about race and inequality in our country. Precipitated by the heightened visibility of police violence, the Black Lives Matter movement is trying to stake out a permanent place in our consciousness. It is trying to integrate into our national narrative, to make sure we remember. It lends a new urgency to remembering the old wounds of Katrina. Admittedly, Waveland and other small towns like it didn’t get as much attention as New Orleans in the coverage of the hurricane. Despite their differences in location, size, population, and wealth, Waveland and New Orleans alike show the struggles of recovering from a traumatic event like Katrina. Waveland’s struggling economic recovery differs from the “entrepreneurial boom” in New Orleans. Yet, in New Orlean’s struggle to rebuild, we find the old problems of gentrification and still-sinking levees. Waveland and New Orleans both display what Shelly Rambo in Spirit and Trauma describes as the “the persistence of that [traumatic] event and the enigma of its remaining” (156). They are not stories of triumph, but stories of survival. The camp where my group was staying was right on the shoreline. You could cross a two-lane road, stand on a brick curb about 6 inches across, and put in a toe in the water. It was too dark and deep to see the bottom, but it was shallow enough that you could still see large branches in the water, breaking the surface, reaching out, withered hands trying to grasp the air. The water moved against these branches, beat against them with tiny, almost negligible waves. The branches were familiar but foreign, out of place. They were reminders of a world which was settling, but is nowhere near normal again. It is tempting in Christianity to read the story of the Paschal mystery as solely a story of suffering, or of triumph. Jesus died, and suffered. When we gaze at the cross, we gaze at and linger in the suffering, hoping it will redeem us. When we turn away from the Cross, to the Resurrection, we turn our back on that suffering, we celebrate life, life everlasting. The mistake, Rambo writes, is in continuing to see life and death as opposites, as polar charges that cannot exist in the same space: “death is behind and life is ahead” (143). Rambo quotes a pastor who observes: “Life for people in New Orleans follows a new timeline: pre-Katrina and post-Katrina” (149). Katrina has changed the narrative, Katrina persists. The life that has emerged in places like New Orleans and Waveland is not a life that can turn its back on death. It is a life that remembers death, that is shaped by that remembering. This is a middle space, a Holy Saturday space, a survival space. This space has theological meaning not in “turning away or turning to the cross, but instead, in the turning itself, the movements between that acknowledge a more tenuous relationship between life and death” (158). The recovery from trauma, as Herman and Rambo both describe it, is a process of integration. It is a long process, a sometimes tedious process of learning to re-narrate the event, to recover the capacity to make meaning out of it. We do this as Christians when we gather for the Eucharist, when we celebrate and remember the paschal mystery. The challenge is to remember that mystery, but not elide over the difficulties. Our faith is not only the Cross and redemptive suffering; it is not only Resurrection and victory. It is also the space between. I have written here my witness to Katrina in fragments, memories, impressions. These are a part of the bigger narrative, their form still taking shape. There are other stories and narratives, some of which were posted as a part of this very series. These were written as acts as remembrance, as a part of drawing others into the story. It would be tempting for me to close out with a story of victory, however minor. An afternoon of teamwork that successfully removed a toxic pool liner. Or a service trip to New Orleans the following year, where we we danced to jazz music and ate beignets in the French Quarter. But these stories would also only be fragments. It is better to listen, to not rush a victorious ending, to let the long arc of the story continue to unfold.